We are so excited to announce the very first #BESTYOU BRIDAL event, being held at ‘The Mews’ prestigious bridal boutique in Clifton, Bristol. Following the success of three sold out #BESTYOU events, makeup artist Sasha Louise Pallari wanted to create a Bridal version, solely focusing on how to feel your absolute best on one of the most important days of your life. Whilst planning her own wedding it’s become very apparent what can cause issues, insecurities and confidence crises’ during the build up of wedding planning. So we’re looking at getting ‘wedding ready’ from a different perspective and are absolutely delighted to be working alongside ‘The Mews’. With branches also in New York and Notting Hill, the highly experienced team really are at the top of their game working with brides globally. A bridal makeup demo by Sasha – sharing all of the important secrets to finding your perfect wedding day makeup look. 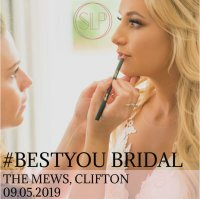 This is an exclusive and very intimate event so the tickets are limited... we really hope you can join us for the very first #BESTYOU BRIDAL.